Passion 4 Profession is a free fitness app for Windows 8 and 8.1 which makes for a great download on all Windows 8 and 8.1 devices. The app contains a massive database to a large collection of exercises and its different variations which can be practiced at your own ease and convenience at home, or at the gym. The app when launched on your device, presents you with a set of menus with options that allow you to target various muscle groups, and when a particular muscle group is clicked, you will be presented with exercises included in the app which target the particular muscle group in question. 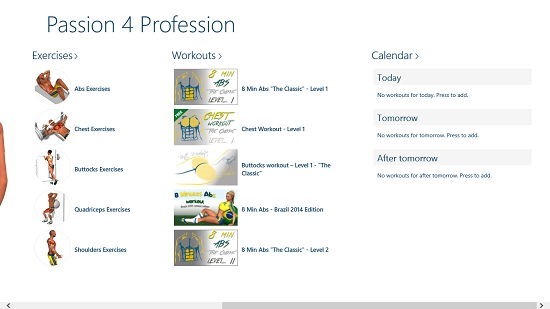 Passion 4 Profession is available for free from the Windows App Store. When you install and run the app on your device, you will be presented with the below interface. Upon scrolling to the right in the above screen, you will be able to see the different exercises which can be performed in the app. You can see this illustrated better in the screenshot below. You can choose to click on any tile under either Workouts or Exercises. Workouts show a set of exercises for a particular muscle group, whereas exercises show only a particular kind or type of exercise, in general. 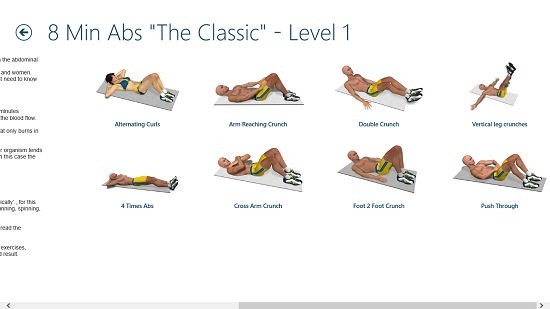 The below screenshot shows an abs workout. You can then click any particular exercise to be presented with the details of the same. 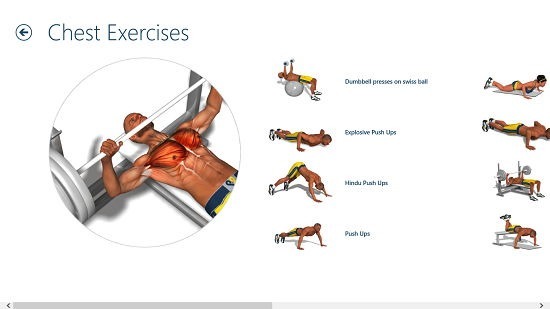 You can then click on any particular exercise in the main screen of the app under the exercises section to be presented with details of the same exercise. You can select a particular exercise under a targeted muscle group by clicking on the same. This concludes the main features of Passion 4 Profession for Windows 8 and 8.1. Passion 4 Profession is a well-designed fitness app for Windows 8 and 8.1 which makes for a great way to be in shape and keep fit. You can grab it from the link below.